Posted byMei 19 February, 2014 4 February, 2014 6 Comments on Eczema Research News – Do Antihistamines work? Will Antihistamine Work for Eczema? Today’s topic is on Antihistamines, do they Work? I’ve read in forums that some patients swear it helps with the itch, while others swear at it for being totally useless. What’s the research in this area? I’ve found a few studies online, but before we go into them, let’s get some Antihistamines’ basics. Antihistamines are medication that are taken orally to block the activity of histamine at skin H1 receptor sites, thus alleviating itch. The older generation of antihistamines is sedative, usually prescribed to relieve itch and scratching at night. Backtrack a step for some of you to understand the rationale – One of the characteristic of eczema is itch, which triggers patients and children with eczema to scratch at the inflamed skin/ lesion. Scratching worsens the skin inflammation, exacerbating the itch-scratch cycle. Scratching also thickens the skin, further breaks down the skin barrier and risks infection. 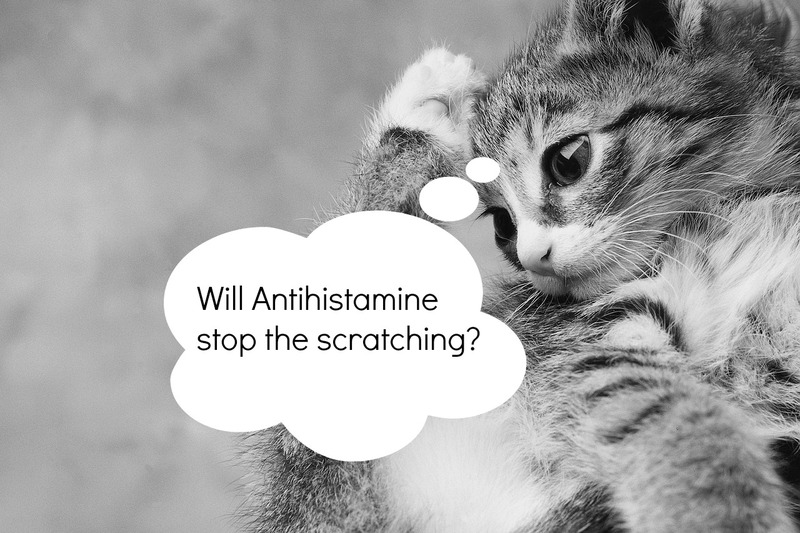 Thus antihistamines are prescribed to alleviate the itch, to reduce scratching. More on scratching here. 1) the sedating types such as alimemazine, chlorphenamine, cyproheptadine, hydroxyzine and promethazine. 2) the non-sedating types such as cetirizine, levocetirizine, loratadine, desloratadine and fexofenadine. Supposedly, the non-sedating type can bind more selectively to the H1 receptors and last longer for 24 hours but many reported not effective. How are Antihistamines supposed to help Eczema patients? Oral H1 antihistamines have been prescribed for eczema patients, usually for their sedative effects. It appears that the sedating type is more commonly concurred to relieve itch better than the non-sedating. However, longer than 2 weeks’ use have been described to render sedating antihistamine ineffective to the patient. Can Antihistamines be prescribed for Children with Eczema? Yes, studies had been conducted for children from age 1, and different antihistamines have different age limits and the dosage depends on the weight of the child. Read that hydroxyzine is not recommended for below 6-month eczema baby and promethazine and alimemazine not for children under 2 years old. Are there side-effects to Antihistamines? Antihistamines may cause side effects such as drowsiness, headaches, constipation, dry mouth and blurred vision, and worsen condition such as glaucoma and retention of urine. What’s the verdict on Antihistamine on Eczema? After reviewing PubMed, it appears that it is difficult to isolate the effect of antihistamine as trials undertaken had used antihistamines as an add-on therapy (imagine which eczema patient would take part in a study that prohibit you from moisturizing and treating your eczema, insisting you consume only antihistamines!). Therefore, there is no conclusion as to whether antihistamines work. Based on a selection of antihistamines’ studies published on PubMed, cetirizine improved eczema (along with topical treatment) while chlorphenamine did not show difference in alleviating scratching at night. Hydroxyzine reported to work better than cyproheptadine in another study. As you can see, there’s no clear conclusion on whether antihistamine is useful, neither is there clear study on whether the sedating type is more useful than the non-sedating. What is your experience? Do share in the comments, greatly appreciate! I am not sure does it work for the itchy, but I still offer her. My girl skin always got eczema but the best way to see the eczema under control by applying steroid, moisturiser and eat the safe foods for 2 weeks. Thanks Pei and great to see that you are managing flare-ups well 🙂 This Sat there’s a wet wrap session and it is also used by some to manage the dry skin and rash 🙂 Hope all who are in Singapore can come and learn! Antihistamines are not often reported by our patients as helpful for their eczema symptoms – compared with say, hay fever, and hives. Much better is to understand the way moisturisers and topic steroids work, and with medical supervision ensure they are being used correctly. The impression many clinicians have is that atopic eczema is under treated – but antihistamines are not often part of the solution, even though they are often recommended. Thanks DrB, I read the article and I didn’t know there’s topical antihistamines! And your site now has a load of resources! Thanks Carrie for sharing! For me, I don’t give my child but when she’s down with a cough and doc prescribes med to help her sleep better at night, I’m quite happy to have her sleep well!